The Little Blue Whale | Plus Lots More Nursery Rhymes | From LittleBabyBum! The Moon Song | Plus Lots More Nursery Rhymes | From LittleBabyBum! Ladybug Ladybug | Plus Lots More Nursery Rhymes | From LittleBabyBum! Down By The Bay | Plus Lots More Nursery Rhymes | From LittleBabyBum! 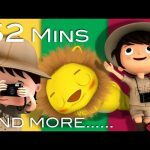 Going On A Lion Hunt | Plus Lots More Nursery Rhymes | From LittleBabyBum!